"When studies can't explain reality, they're worthless. When they deny reality, they're suspect. "I witnessed my son lose speech IMMEDIATELY after a set of shots (which included MMR), even have a documented email that I sent to his pediatrician 3 days after the vaccines letting him know that I was concerned and terrified that my son went from talking all day to being mute since his shots, staring into space, not responding to his name, etc. He called me the same day and told me that it's normal for children his age to lose speech sometimes... just wow. Sick of being called crazy and people saying that I'm looking for something to blame. My son has had 1 year of speech therapy so far and still doesn't talk very much. He turned 3 at the end of May. -Andrea K. "I'm so sorry Andrea! I am a speech therapist. And I am so sad to say how often I have families come in and tell me the same thing. I don't understand why a doctor can't see this. I am not a doctor. They are not listening to me either. But I am in this fight because of all of my clients." -Bridgett C.
"Hello, I have a 3 month of little girl who has just been diagnosed with epilepsy. She had 1 seizure before her 2 month birthday then she went to get pediatrician for her 2 month visit where she received ALL of her vaccines. My boyfriend is pro vaccine and I am not. We have had many conversations about this topic. I had decided I would not vaccinate her and when I got to that appointment I chocked. I was terrified either way ... and with the nudge from her pediatrician and my boyfriend I agreed to have her vaccinated. One week after that I noticed my daughter having an occasional seizure and a week after that it was happening multiple times a day. I brought her to the ER where she was admitted and diagnosed with epilepsy. She is now on 2 different medications and is scheduled for an MRI. I hate the fact that she's on medication. She's only 3 months young! In my heart I feel her seizures were provoked by those vaccines. I need your help please! I'm wondering if you have heard of this happening...? The most important question. How can I treat her seizures without prescription drugs? I don't want to give her any more toxic chemicals. I want to heal her naturally. Any information you can provide would be greatly appreciated! I am located in RI. If you can refer me to a naturopathic doctor anywhere. I am willing to travel anywhere to get her off these meds and seizure free. Thank you in advance." Another mother wrote: I woke up when my nephew was catastrophically vaccine injured resulting in permanent brain damage. Then I stopped vaccinating my girls, and went as all natural and organic as possible. Their asthma, allergies, ear infections, respiratory infections, bowel problems all got better when we STOPPED going to the doctor! Doctors are making us sick and they are too blind to see it! "Our bodies are ecosystems for trillions of microorganisms that, each doing its own thing, somehow keep the body's impossibly intricate circulation, muscular, hormonal, digestive, skeletal, respiratory, and nervous systems in balance and functioning. We have thousands of known species of bacteria in our bodies with more being discovered every year. For the great majority of these species, we have no inkling of their functions. Blasting our bacteria with blunderbuss antibiotics, or bludgeoning other systems in the human ecology with equally blunt weapons such as vaccines, will almost certainly cause collateral damage, some of which may not be known for decades to come. It should come as no surprise to any scientist that a sanitized environment can be dangerous, as can be medical procedures that change the human body's chemical balance. "Who has an incentive to curb needless or even harmful use of vaccines and medications? Not the government health bureaucracies that enlarge their influence with each new dictate that they deliver. Not the medical research establishment that depends on grants from the health bureaucracy. Not the pharmaceutical companies that lobby for and then profit from government mandates that require their products be used. In the case of vaccines, a $30-billion a year global business, the pharmaceutical companies have even been exempted from any liability whatsoever in the U.S. market in the event that their products debilitate or kill. Jon Rappoport: Vaccine-Related Brain Damage: the Mothers Know! I find it insulting and infuriating when I hear about the 'inconvenience' that resulted from the measles outbreak that affected 150ish people. Picture this. Shopping in Target, my daughter begins having a prolonged absence seizure. I have a 7 week old baby in a carrier and somehow I manage to carry my 7 year old daughter to a table in the Starbucks Cafe area near the entrance of the store. My 75 year old mother-in-law takes my other daughter out to our car to grab our 'Seizure Bag.' Meanwhile, the baby wakes up screaming and all I can think to do is nurse him because now we are really drawing attention to ourselves. While the baby is nursing, my seizing daughter wets her pants, soaking both of us in pee (bladder incontinence was common for us during seizures) The baby falls back to sleep and I manage to get him out of the carrier and into the stroller. Yes, all while still holding onto my seizing daughter. What seems like forever, but is only 5 minutes later, and my mother in law and daughter return with our 'equipment'. I carry my daughter to a 'remote' corner of the Starbucks, STILL seizing, and lay her down on a blanket. Mother in law holds up another blanket to shield us from the piteous stares of the small group that has gathered round. I have to undress my daughter and administer Diastat (rectally) to stop the seizure. A sweet manager lady from Target brings us some new clothes to get her dressed and helps me clean up the mess. Seizure over, I pick up my daughter to carry her to the car and she vomits all over me (another common event post seizure). Finally, we make it home, I carry her inside and she goes through the standard four or so hours of fitful sleep accompanied by migraine like headaches, vomiting, and tortured screaming. So, yeah. THIS was inconvenient. Measles? NOT. EVEN. ON. THE. RADAR. Response to the New York Times article "Eliminate Vaccine Exemptions"
Do you understand that if you allow the people YOU ELECTED to take away YOUR RIGHT TO REFUSE, that you will not be able to refuse the NEXT 200-300 vaccines in the pipeline? "What I fight for: In August 2008, my son got his 2 month vaccines. A week later he was sick. He was dying. He had histiocytosis. We didn't make the connection. Every time he got better and we started vaccinating again, he relapsed. At 2-1/2 years old we were told he had to have a bone marrow transplant. Without it, he would die. We were also told he could never get another vaccine. But because "histio" is rare, he doesn't qualify for a medical exemption. And neither do his siblings, even though there may be a genetic link. He turns 7 this year. He's alive, and has not relapses since vaccines were stopped. I am TERRIFIED that my right to protect my son from suffering like that again, from possible death, will be taken away. That we will be forced to inject him with viruses that will trigger an immune response that won't turn off, causing the immature white cells to form tumors in his chest, lungs, liver and lesions on his skin. And that this time, there won't be a way to save him." This isn't about whether kids should or shouldn't be vaccinated. This is about taking away my right to protect my child, and my sons right to pursue life without fear. What's YOUR reason to fight?" Serious Rash and Persistant Cough after DTaP Vaccine! Wanted to share this. My daughter 7 days after Dtap vaccine. I was only doing one injection at a time because of my fears concerning vaccines. I foolishly never made the connection between this rash and the vaccine. The worst part of this reaction is that it was followed by a 3 month cough. Not one doctor could tell me what this rash was from. I took her to 3 different doctors. The pulmonary doctor misdiagnosed her with asthma. When her cough cleared we knew she did not have asthma. I took her in for her dtap booster 6 months later and same thing happened. This time a 4 month cough that was eventually diagnosed as the RSV virus by the emergency room. We live in California. Luckily my pediatrician says this is most definitely a reaction to the vaccination and will be giving her a medical exemption. 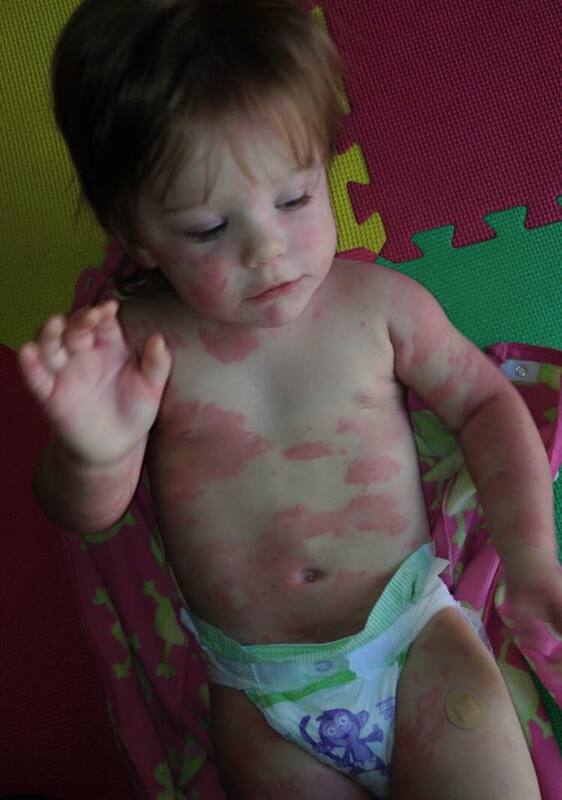 My daughter now has eczema and has to eat a special diet to help with skin issues. I am more afraid of the vaccines than I am of the diseases at this point. I eventually took her to an immunologist who also agreed this was a vaccine reaction but he couldn't tell me which component she reacted to but it was safe to give her other vaccines. No thank you! My pediatrician agrees no more vaccines for now. "I have seen the empty glossed over eyes. So lifeless in expression. They stare right through you, yet long to truly know you. The cold eyes that stray from focus and identify you as nothing more than a silhouette in the room. It's evident parts of the brain are shut off like a light switch attached to a broken lightbulb. You desperately try to find all the missing pieces. You lose yourself in the moments you once called sleep, replaying the classic "what if" scenarios like numbered sheep. Praying for answers, taunted by a deep feeling of guilt that eats your insides like a parasite. You spend obsessive amounts of time, reading about others and their journeys, simply because you are desperate for a means to connect. The real desperation comes from having a means for your child to connect. Crying your eyes out, reliving every detail of what you read, as if it is your own. Then you realize, this story has been written before, by many. Their children too, were here but now gone. It's a death without closure. It's a birthday without celebration. It's a nightmare that one can't ever awaken from. It's a different kind of worry about retirement. Instead of worrying about who will attend to the financial affairs in passing, all that seems to worry is who will care for my adult child? You listen to others ignore your child. Watch people count your child as nothing more than another 1 in 30 statistic. Struggle to breathe in realizing that these children will one day make up our future, and most can't manage a few words in conversation. Your short of breathe in horror at how little most notice. While some parents go on to stress about after school games or practice, other parents pray for the day they can comfortably let their child play out in the front yard without having constant worry about a life threatening seizure. Parents that long to rejoice in the celebration of potty training and deliverance from diaper expenses, need to try on a size of reality that some of these kids never graduate or celebrate life without diapers. While most parents celebrate proud "move away from home" departures, other parents wake up in constant panic checking to make sure their child has not left the house and wandered into trouble...or traffic.